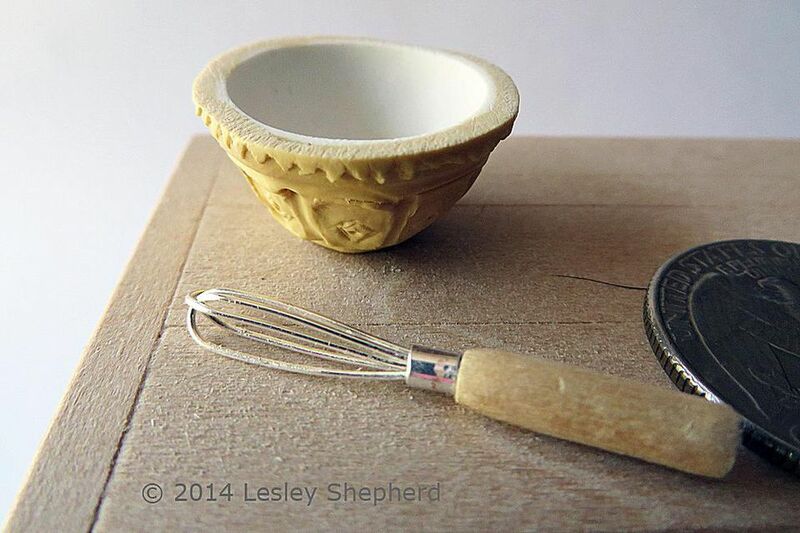 For miniature baking scenes in a dollhouse, balloon whisks are an easy to make detail. The whisks have been around since the 1800's so they fit into many periods. If you are working on a Stuart or Tudor dollhouse, you may be showing bundles of twigs used as whisks for your prep. Julia Child is credited with introducing the balloon whisk to the average kitchen in the 1950's in the U.S.A. Long a staple of European homes and commercial kitchens, it took a bit longer to be adopted in parts of North America. Balloon whisks are often scene in the company of copper bowls, for perfect egg whites for meringues. They can also be used to sift dry ingredients together, as well as blend sauces in saucepans and eggs and liquids into cake batter. You can make these balloon whisks in many scales, just check that the wire gauge is strong enough to hold the shape of the 'balloon'. Stainless or Silvered Beading Wire - I used three, 1 1/2 inch (3.8cm) lengths of #24 gauge for a 1:12 scale balloon whisk. Tiny amount of two part epoxy putty - or use a thick glue or silicon glue, to hold the wires onto the wooden handle. Razor Saw and Miter Box - to cut the handle stock to length. To start making the handle for your miniature balloon whisk you can use either a piece of fine dowelling or a piece of square stock craft wood. You want your final rounded handle to be 1/8 inch (3mm) or less in diameter after you have shaped it down using miniature files and sandpaper. You will need a section of wood at least 1/2 inch (1.2cm) long. You may be able to find a suitable wooden bead to use as a handle. First mark the center of your square stock or dowelling, and drill a hole squarely into the center of the wood. Don't have the drill at a slight angle as you see in the photo on this page. You want the drill hole to go right down the center of the wood. This hole will hold the wires for the whisk, at least six pieces of the wire you have chosen. The hole should be roughly 1/8 - 3/16 in. ( 3-5mm) deep, and only as wide as you need for six lengths of wire (3 pieces doubled up) See all the steps in this tutorial before you drill your hole for your wires. Your chosen crimp bead should completely cover the drilled hole to finish the whisk. The miniature balloon whisk is easiest to assemble while it is still attached to a larger piece of craft wood. To make a round handle, I used needle files and sandpaper on a sanding block to take off the corners of my square craft wood as you can see in the photo. The length of dowel I worked on was roughly 1 in. (2.5 cm) long so I can cut a handle off the rounded section. As you file or sand down your wood, check that you keep the hole for the wires centered in your handle. The wood should be filed down until it is roughly 1/8 - 3/16 inch (3 - 5mm) in diameter, leaving some space evenly around the edge of the hole which will support the whisk wires. For now, file the handle evenly as a cylinder. When you fit the wires and the crimp bead or foil to the top of the whisk, you will need to file or sand the end of the handle to blend into the crimp bead if possible. When you have the handle shaped roughly with the file, use fine sandpaper to smooth down your wood to a finished surface. To make the wires for your dollhouse balloon whisk, cut 4-6 pieces, 1 1/2 inch (3.8 cm) pieces of fine wire, I used #24 gauge for my 1:12 scale whisk. You will need at least three perfectly straight pieces of wire for each whisk. To get the most realistic whisk possible, make sure your wire is straight with no kinks. Shape the wires around a narrow cylinder by bending them roughly in half around a suitable curve. I used the smooth section of one of my needle file handles. As you finish each section, use your pliers to make sure the bases of the wires are neatly side by side, and insert the section into your crimp bead. Each section should be inserted over the previous one, so that they cross. Try to set your wires at the points of the arms of a clock , ten after and twenty two for the first bent wire, twenty after and ten two for the second wire, and half past and on the hour for the third wire. Take care not to kink the loops as you insert them. If you don't have a suitable crimp bead, you can insert the wires into the wooden handle directly, but see the next step for how to hold the wires in place with glue or epoxy putty. You can crimp your bead over the wires using pliers if it makes it easier to hold the wires in place as you insert them into the handle. Try to crimp the bead on all sides, so it remains rounded, rather than flattened. To finish the assembly of the dollhouse scale balloon whisk, mix a small roll of two part epoxy putty (any brand, see the small grey blob in the photo) and when it is sticky, set it into the hole in the handle of the whisk. Insert the wires below the crimp bead into the handle. Re-adjust the wires if necessary and put a small amount of epoxy putty (or you can use a thick silicone glue) into the crimp bead. You want the glue or epoxy to hold the wires in the handle and hold them in position inside the crimp bead, as well as holding the crimp bead tightly to the top of the handle. If you aren't use a crimp bead, set the wires into putty or glue in the handle, and wrap a section of heavy foil tightly around the wires, holding the heavy foil to the wires and the handle with a bit of epoxy putty inside the foil. Clean off any excess glue or putty before it sets. The final step in finishing the miniature balloon whisk is to cut the handle free of your stock wood, and finish shaping the handle. Do this after the wires and the crimp bead are securely set in the glue or epoxy putty. Use a razor saw and a miter box to cut off the handle at the correct length. Balloon whisks vary greatly in styles and lengths, you could make an entire kitchen shelf full of different balloon whisks for a chef's kitchen if you wish. To finish shaping the handle after it is cut free, carefully sand or file the top of the handle where it meets the base of the bead. Sand the end of the handle flat. You can use your whisk in a standard saucepan for sauces, use it in a classic mixing bowl, or cover it with flour or dough and set it on a traditional pastry board. If you want some raw eggs whole or partially mixed for a baking scene, use the instructions linked that make them from acrylic artist's mediums. Share what you make with these instructions in the miniatures forum. Everyone loves to see how everyone else gets on!